Anondson wrote: It's just upstream a bit, around the bend, under the Browndale bridge. Ah! I totally got them mixed up! Galleria Barnes and Noble is going to open a concept restaurant. RFP for a development near Valley View and Wooddale. Done right, it could turn into a nice little node. There will be loud complaints over traffic, at rush hour there are already some rather heavy cut throughs. I actually live quite close to this little node. Apparently two proposals were received so far. I am looking forward to a high end condo or row house building. The westbound traffic here can back up a few blocks during rush hour though. In fact, there is a listing on Edina Realty for a 3-story condo building (link below), which would be made by Gatehouse Properties, the developer for Wooddale Flats. This would be instead of the Neighborhood Ice Cream Shop building across the street from the city parcel, which seems to be only half leased - no new leases are being signed either. I would not be surprised if they were already in negotiations to sell the building. No formal proposals have been received by the city at this time however. I also would not be surprised if Gatehouse made a proposal for the city parcel either. 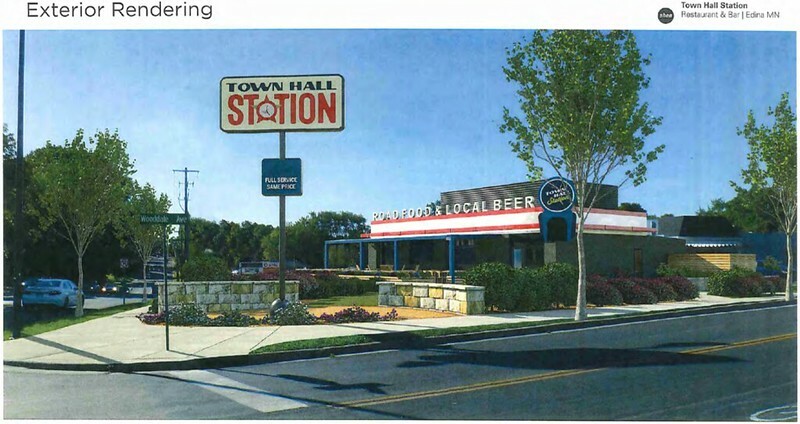 As for the former Wallys gas station, Town Hall Brewery has proposed their restaurant-brewpub concept for this corner. A neighborhood meeting will take place tonight at 6. Seems there is some simmering anti-density/anti-development angst. Too late to run against Mayor Hovland though...he's running unchallenged. Oh yes. There is discontent. I live in a Nextdoor neighborhood adjacent to a couple northwestern edge Edina neighborhoods. Lotsa complainypants. Seems that honestly the old timers are outnumbered by people wanting some accommodation for urbanish amenities in places. Those comments are always fun to read. Anondson wrote: Might as well collect miscellaneous Edina developments of interest in a unified Edina thread. Finance and Commerce has an unlocked post on the Opus redevelopment of a former office once used by United Health until it outgrew and built its large campuses across 169. The story makes big emphasis on proximity to Southdale and the types of developments around Southdale. I think more interesting is how near this is to the proposed future SWLRT station along Bren Road in Opus II. Also, the future Nine Mile Creek regional bike trail will run right next to this. The Edina City Council voted 3-1 Tuesday night to preliminarily approve a 250-apartment building proposed by The Opus Group, despite opposition from some neighbors over traffic, lighting and other worries. The $40 million project includes a $2 million donation to the city for affordable housing, Edina City Manager Scott Neal said on Twitter during the meeting. Minnetonka-based Opus will make the payment instead of setting aside units for affordable housing in the project. The city can use the money toward an affordable housing project in another location which would have better access to mass transit and retail- or service-oriented jobs nearby. There is a lot of worry construction of this simultaneously with the 169 work will cause unprecedented congestion. I think 169 alone is going to be enough of a bad time, but it's not reason to deny it. If the site was ever fully reused as an office it would bring more traffic than the units. A drawing of the future Town Hall Station restaurant in the former Wally's gas station at Valley View and Wooddale. Chuck Marohn took a van tour around Edina, to Southdale/Centennial Lakes, 50th/France, and Grandview. Each of the three sites were live streamed on the city of Edina Facebook page. Watching the three was voyeuristically fun to see each area analyzed. Each of the three can be watched now after the fact. Anondson wrote: A drawing of the future Town Hall Station restaurant in the former Wally's gas station at Valley View and Wooddale. I piece of Parkwood Knolls is trying again to detach from the Hopkins school district and join the Edina school district. No idea why Hopkins Schools would agree to this. And I hope they don't -- similar requests have been made of Richfield Schools' territory around Southdale, and this would set a bad precedent. The last thing these neighboring districts need is to lose high-value properties to already-prosperous Edina Public Schools. I can tell you with intimate knowledge, they did not engage the Presidents neighborhood with their, ahem, “Unite Edina” campaign. It was noted, and is remembered by some. Also how their Nextdoor neighborhood was conveniently drawn to exclude the couple apartments along 169. Parkwood's ongoing blockading of streets during 169's closure, causing significant disruption to their neighbors, has also been noted and will be remembered. Not a great way to win friends and influence people. Town Hall Station was finished in August or September. It has been packed every night since then. It is a huge amenity to the neighborhood. I live within easy walking distance of THS and go by on my way home every day. It definitely has been a very busy spot even late into the evening (a couple days a week I teach night classes and am going by at 10 or 10:30pm which bodes well for them. I do think they had a lot of business because of the patio space in the summer/fall. I hope that they are able to sustain themselves over the winter months without that (hopefully they crunched the numbers on that) because there is not a lot of seating inside. Let's just say that the Nextdoor site comments on this before it opened were quite entertaining to read through. I was impressed though that there were some people standing up for urban amenities. I've posted in the comments on streets.mn articles before that there is absolutely a struggle taking place in Edina right now between younger residents who live there because it has a lot of urban amenities/transportation/feel/density (compared with other suburbs) while being quite a well run city for the most part and those older residents who moved there because they wanted a suburban experience and are quite leery of development/etc. Hah, me too, about 3-4 blocks away. Apparently two proposals were received so far. I am looking forward to a high end condo or row house building. The westbound traffic here can back up a few blocks during rush hour though. On my way home today I noticed (it's possible it's been there for a couple of days I suppose, but normally I'd notice such a thing) that there was a redevelopment/zoning sign up on the city parcel at Kellogg & Wooddalle mentioning Edina Flats LLC. A quick dig indicates this is still Gatehouse so they must have changed the name. See their site for some information and more comprehensive plans at the city's site. Looks like 18 units of 3 story condos. Could be worse, could be better would be my initial take. It'll be interesting to see if this ruffles feathers on Nextdoor. BenFranske wrote: there is absolutely a struggle taking place in Edina right now between younger residents who live there because it has a lot of urban amenities/transportation/feel/density (compared with other suburbs) while being quite a well run city for the most part and those older residents who moved there because they wanted a suburban experience and are quite leery of development/etc.